On a nondescript spring afternoon, Fatima Al Qadiri walks into a tiny Korean cafe in Brooklyn wearing a giant silver bomber jacket. Her short brown hair is swept into a flick that curls about her face like a perpetual question mark, underlining the playful light that dances in her eyes when deep in discussion of her work. 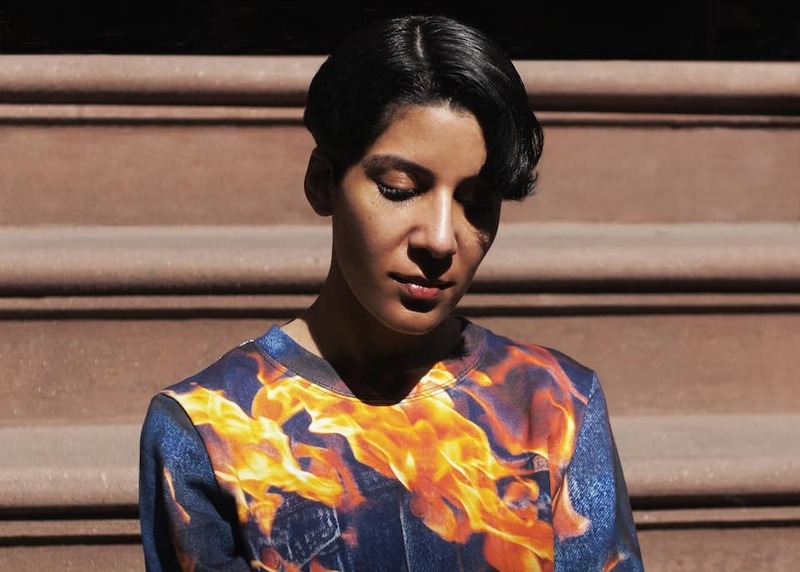 And there’s a lot of work to discuss, funneled through three discreet yet interdependent identities: Fatima Al Qadiri the music artist, Fatima Al Qadiri the Future Brown producer and Fatima Al Qadiri the visual artist and co-founder of the art collective GCC. What makes Al Qadiri such a thrilling prospect, whichever framework she's working within, is her rejection of our era's default and often frustrating conceptual ambiguity; aesthetics with the politics surgically removed. With Al Qadiri, the two are righteously entwined. When she makes something, it is for a reason, and one that she is not going to shy away from sharing. "My mom writes short stories, and I feel like my method of music making is narrative," she says. "That's why some of my records have been described as concept albums. No, that's my genre: it's all going to be conceptual from now until I stop making music. Everything has to have a portrayal of some kind of world. It has to be something that is grounded in some kind of idea or a real life event or memory or something. It can't just be floating around into the ether." Threading throughout all three incarnations to varying degrees are explorations of the relationships between memory and reality, power and perception, the individual and society. 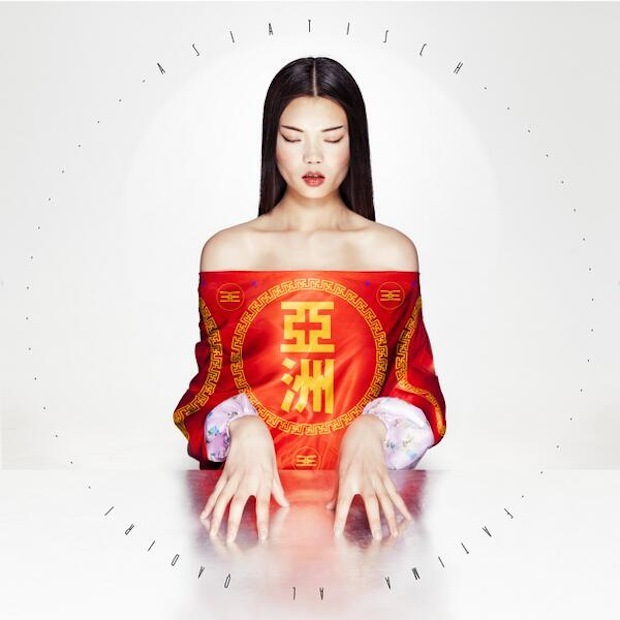 Asiatisch, Al Qadiri's debut artist album on London label Hyperdub, plays with "Asian" sonic motifs in an attempt to question the "imagined China" that decades of stereotyping have washed up on the shores of the western subconscious. In addition to recurring melodic motifs, a number of tracks feature a robotized female voice narrating classical Chinese poetry in scrambled sentences. The scrambling might be lost on western ears, but Al Qadiri is clear to point it out: all is not what it seems. In her role as producer for R&B semi-supergroup Future Brown—her collaborative project with Lit City Trax label boss J-Cush and Nguzunguzu’s Asma Maroof and Daniel Pineda—she works with a range of vocalists who couldn’t be more diverse, both in geographical location and genre. Perhaps Future Brown are actively involved in challenging the predominant language of pop? "I feel like it's more about having different voices," she says. "It's a really equal opportunity workspace. Two girls, two guys, so many different countries. It's so cute. That's what I'm really excited about." Then there’s her work with GCC, a group of artists that includes her filmmaker sister Monira Al Qadiri and author friend Sophia Al Maria. Conceived at the art fair Art Dubai, GCC seeks to explore what work is and isn't being done within the sphere of public diplomatic relations. The group currently have an exhibit at MoMA PS1, which features a series of trophies they have awarded to themselves etched with empty accolades (see below)—symbols of the theatre at play in diplomatic exchange. That Al Qadiri is able to do this work, let alone explore these pressing themes, is something she credits to her "extremely supportive" mother. "I would not be here talking to you if it weren't for my mother. I'd be in Kuwait with 2.5 children working in a bank. Thank god that's not my reality." In this extensive interview, she talks about what shaped her musical palette, the power at play in stereotyping and doing boy drag with her sister. One of the first things I wanted to talk about is representation, because it feels like a recurring theme throughout your work. First with Desert Strike and the war in Iraq, and now with Asiatisch and China. I wouldn’t say it was a representation of the war. It was based on the game you were playing as a child, which was based on the war. There’s something about reducing a war to a game which also implies power relations. There’s a link between representation and power relations. I feel like it’s about memory. The same with Asiatisch—it’s remembering all the Asian motifs you’ve heard throughout your life, remembering the stereotypes, and remembering what "Asia" and "Asian" mean, what they means too in what context. "I want people to mispronounce it. I want it to get stuck in their mouth." The reasons why stereotypes are circulated are to do with power relations, to do with how the US wants China to be seen, because that therefore controls a certain flow of commerce or of public opinion. Stereotypes are definitely about power: demonizing a group of people in order to usurp their power somehow, or to create fear mongering to deflect from some from other real problem, you know? All governments need an enemy for that very purpose: to deflect from troubles at home. This fear mongering toward China has existed for a fair amount of time, and it has become quite intense in the last 10-15 years, with the rise of the new wealthy class in China, and the economic implications of that. It’s just very easy to demonize China from so many different angles. But I am not seeking to represent anyone, I’m posing some questions—about stereotypes, about how inherently problematic the word "Asian" is. Hence my use of the word "Asian" in German, to make it even more alien, you know? In British English, "Asian" doesn’t mean what it means in America. So I didn’t want to use the English word for "Asian"; I wanted to use a foreign word, an even more foreign word, which is [the] German [one]. I want people to mispronounce it. I want it to get stuck in their mouth. When you said that fear-mongering toward China intensified 10-15 years ago, it made me think about the birth of grime, which was around that time. Grime, which is a musical language you've referenced, has been borrowing melodic elements from East since the very beginning. I think that the love of Asian motifs in music is an old one, and it’s just been mutating and transforming with every generation in every area in the West. It’s not something that became a trend; it’s never been untrendy. It’s so ubiquitous nobody talks about it. Why have Asian motifs been so popular in so many different mediums and genres? That’s because they’re instantly recognizable, somehow satisfying, and very basic in a way. In grime, but also in general, their use has some kind of implied wisdom, some kind of implied Shaolin element that is appealing to young producers and rappers because it has this “I am pure, I am powerful, I am all-knowing and all-seeing” thing. It’s the combination of mystical and physical power, you know? It’s very alluring for music makers. I’m curious about the relationship between Asiatisch, which explores ideas of China in the collective consciousness in the west, and your work with GCC. GCC is about the performance of work in diplomacy. Work is being performed, but work is not actually happening; it’s about the absence of labor. The majority of the Gulf countries have a very sophisticated welfare state in comparison to here, and you are guaranteed a job by your country. If you don’t have a job, you are going to get paid; there is no end to your unemployment benefits, and so people in government in the public sector are less inclined to really achieve or do anything beyond the extreme [minimum]. Everybody I know who works in the public sector just goes to work and checks Facebook all day; that’s what they do. GCC. Berlin Congratulant. 2013. 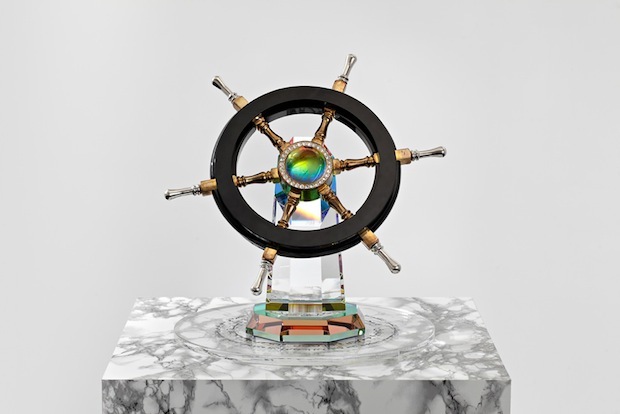 Courtesy Kraupa-Tuskany Zeidler Gallery, Berlin. Where does the satisfaction come from in that? Participating in global consumer culture, which I think is a fleeting moment of satisfaction. Then you have the government—and I think this is for all governments, not just the Gulf governments—and all these diplomatic photo opps, which are about the performance of work. "Oh yes, we came here and we talked about important things like how to eradicate world hunger and the environment and…" You just went to the spa and had 7-thousand dollar meals; give me a break, honey. It’s just photo opps and the performance of labor. Then you have the migrant laborer, and this also includes China. The migrant worker in the Middle East—the majority of them come from the Indian subcontinent, and they work under horrendous conditions. They have almost zero rights, and they are building all these goddamn skyscrapers, these giant urban planning projects that are being built in a desert. In a similar way, you have Chinese factory workers making every kind of technological gadgetry for the west, but they are very far away from us, and that somehow gives the west some sort of clean conscious. But it doesn’t. We always say today that we are so removed from the manufacturing process. This is how conglomerates make humongous amounts of money: they are no longer paying their citizens. There are no unions that can protest to them. Corrupt governments elsewhere are just making deals with them—just making a quick buck—and the populations in Bangladesh and China are suffering. So, for instance, one of the tracks on the record is called “Shenzhen.” [Major Chinese city] Shenzhen has one of the biggest factories in the world. That is the really sinister yet seductive track. It’s very you. I definitely make music for the bad guys. I always feel like when me and my sister were kids, the theme music for villains was the best. So I feel like I always made music for…a villainous element. "I definitely make music for the bad guys." Something that is really present on this album, and throughout your work, is this choral sound effect. I think I use the choir synths because I don’t want to use my voice. Even though it’s a synthesizer, it’s a human element; it’s me trying to insert a human element in this digital audio. I also do love mass, and I am a big fan of religious music. I am a really big fan of choirs, whether real or virtual, so it’s something that doesn’t really leave my music. I have been doing it since I was a kid, so it’s just like this security blanket. Somebody once accidentally tweeted that I made this track for this fashion show, because it had choirs in it. It had became so associated with my sound. I was just cracking up, like, "Thanks but no thanks." Talking about choirs is making me think about the way the individual is consumed into a choir. With the Cooperation Council for the Arab States of the Gulf (or the real-life GCC), whole individual countries are consumed into a conglomerate identity of the Middle East. Then, obviously with Asia, too: this massive sprawling continent with so many different identities folded into this imagined... Into this monolithic word. I have a problem with the word "Asia," because nobody would call an English person European. English people would not stand for it. Why would it be acceptable to be called Asian? Because no one can recognize what a Chinese person is? Or Japanese? Or Korean? In England, a Pakistani person or an Indian person? That's the problem—it's too easy to group people into this giant whole called Asia, rather than say, "Oh, I don't know where you're from." It's too easy. It's become acceptable. When the album was coming into shape for you, did you have any fears about whether drawing on these elements and ideas could be interpreted as perpetuating the stereotypes you're trying to explore? No, no, no. The whole idea is to put forth this idea that there has been a very serious othering of China. There is a problem with the word "Asian." There has been a long love affair with Asian motifs in music in the West, so let's talk about it. I never have any fear with anything I do. Where does that security in your own identity come from? It's inspiring. I think it's my dad. My dad was so harsh with us psychologically as children and he only had girls. Was that a big deal, to only have girls? If you don't have a brother, you can get away with less, I think. You have less freedom of movement because your brother could be your chaperone, etc. My father was really stringent and tough with us, and I think that made us have this...I feel very secure in my shoes. I can be insecure with other things, but work, oh no. I'm never going to put anything out into the world that I'm not 1000% sure of. No way. I'll keep it to myself. 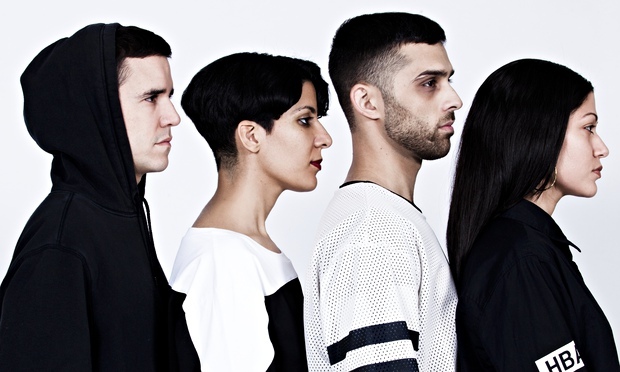 You've got the world of Future Brown, which is a very different world to Fatima Al Qadiri, which is a different world to GCC. How do keep all three worlds spinning? Future Brown is about to get really crazy this year, with the release of the album. It's hopefully coming out in September. Once that's out, I'm sure there's going to be a real Future Brown tour. We have two gigs this summer—one at Sonar, and one at this French festival Villette Sonique. I think the thing that really spurred me personally into Future Brown and wanting to do something with a production team for vocals was when me and J-Cush were watching a documentary about Bad. How many producers worked on Bad including Michael [Jackson] and Quincey Jones? I genuinely believe there's strength in numbers, and I really enjoy collaborating because I get to do things I can't do by myself. Future Brown photographed by Christelle De Castro. When you were starting your production work, was there a point where you were like, "This is satisfying something, but I also want this to do these other things?" It happened very naturally. See, here's the thing: I've been working with collaboration for years. I started collaborating with my sister Monira when we were teenagers. I actually uncovered the craziest photographs I took of her when she was 14. We would raid my father's closet and she looked very boyish at the time. She changed her hair. I don't know how my parents let her. I made her a fake mustache and she'd be holding a dagger. They were really crazy pictures for a 14-year-old girl. It's drag, straight-up. Teenage drag king. I was obsessed with her performance of masculinity. It was capturing performances of masculinity by a teenage girl, trying to perform adult manhood, in an extremely sexist society. Somehow we got away with it, because my dad's door was just open and we'd take his clothes. It barely fit her, but we got away with it.